While in the Central Valley, we were able to visit the Chicken Queen and her 100 plus chickens. Just when I think we have the coolest hen house and a "run" for the chickens suitable for the San Diego Zoo, I come home after visiting her and hang my head. Our chickens are not 100% protected from the rain. Our chickens don't have dry straw under their feet 100% of the time. Our chickens are all mixed together and aren't separated by breed. Am I a bad Chicken Mama? Sigh...I guess we need to be able to work towards perfection and not start off perfectly otherwise what is left to learn? As you can see in this photo, the chickens live in a solid structure with dirt floors covered with pine shavings. Our coop does have a linoleum floor and then an outside "run" area. Yes, chickens DO run. They run for food. And to get away from Bruce, the black Austrolorp rooster. We are thinking of re-doing the outside area with a solid roof of corrugated tin. I think it will really make a difference to the chickens. Right now their outside area is wet and muddy...not at all good for chickens. We are going to need to fix that in the next month. 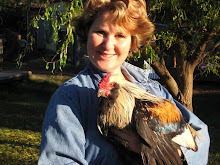 I promise to right more this year and give you more news of chickens and the farm. My early New Years resolution! What is yours? Farmer Jeff and I have gone to our respective childhood homes for the holidays and have found ourselves smack dab in the middle of wonderful, rich traditions...of Mexico. While visiting Jeff's family in the Central Valley of California, we were treated to a great performance by Ballet Folklorico Mexicano de Carlos Moreno with Mariachi Colima. It was so much fun! They did the dance from Veracruz in which the couple ties a big bow from the man's red sash, lots of stomping, hooting and hollering in a Norteno style of cowboy music and then some wonderful Indian dances. The mariachi group was fun with its blaring trumpets and the deep throated guitarron. We just don't get to hear live mariachi bands. We can, however, hear them at our favorite taqueria on the jukebox! After an all to brief time in "the Valley", we flew down to San Diego and drove directly to Point Loma Seafood for lunch. A big lunch! I had an oyster Po'boy and red clam chowder while Farmer Jeff had white clam chowder and a fried squid sandwich. We waited long enough to be hungry again for dinner...thankfully. We had a very good reason to pray for hunger. HOMEMADE TAMALES!!! For those of you unfamiliar with Mexican Christmas traditions, it is customary to make tamales at Christmas. Not just pork, chicken or beef tamales, but this is when you see the sweet tamales with raisins, pineapple, prunes, or apples. The sweet ones are an acquired taste. Last night's tamales were "red sauce" chicken. The masa was PERFECT!!! So soft, but not too soft and had the flavor of both chicken AND the rich red chile sauce. They were big, so I could only comfortably eat one...but Farmer Jeff and the other men in the house managed two apiece. We took a drive to the beach community of Ocean Beach. There we had Poma "torpedo" sandwiches with salami, mortadella, provolone and then lettuce, tomato, peperoncini and dressing of olive oil and red vinegar. YUM!!! After eating that we walked up and down Newport Avenue, poking our heads into the antique stores. While walking we couldn't help but notice the unmistakable smell of corn tortillas cooking. Maybe not specifically tortillas, but certainly warm, Mexican corn-based foods. I am not exaggerating when I say that we walked 8 blocks and this smell was present everywhere we walked! And now? We are getting ready to go and have dinner at our FAVORITE Mexican Seafood restaurant, Mariscos Mazatlan. It is worth the drive to Chula Vista! Farmer Jeff is reading the menu to me...Shrimp with garlic, Shrimp wrapped in bacon and grilled, Shrimp cooked in a Molcajete served with cactus....Thanks to brother Chris who turned us on to it!!! Tomorrow we will visit our other favorite Mexican place, El Indio. I know that I will order 2 taquitos with guacamole and cheese, along with a small all shredded meat burrito! YEE HAW!!! Muchisimas Gracias, Mexico!!! Being from San Diego, a warm home meant one that was hospitable, not one where you actually had to think about going in the get warm because of cold temperatures outside. Tonight we are talking about literally getting the house heated and staying warm! I was away for a couple days on a short jaunt to the Central Valley. I came home to a vista of snow capped hills just miles from the house! Every once in a while we will have some snow visible for a couple of days in February, but I don't remember snow in December. Farmer Jeff lovingly wrapped up all of the citrus trees on our property,we have 6, and then wrapped up all of the citrus trees over at the Ruff Garlick Patch. He also tended to the chickens and gave them an insulated "window". Now they are nice and toasty. Where are the other animals? Taking it easy, of course. No worries of cold for them! In this bizarre time of our whiplash economy I remind myself to savor the simple things in life. Last night was one of those sublime, yet simple moments. We are experiencing our normal glorious weather of sunshine during the day and freezing cold nights...literally freezing. Farmer Jeff crawled into bed and started to snuggle up to me when our little guy, Tasso, crawled up between us. Farmer Jeff curled on to his side, draped his arm over the little guy and then the little guy snuggled up against me. Not to be outdone by the dogs, my precious kitty, Ginger, snuggled into my arms, creating a four body spooning. To cap it all off, little kitty, Chloe, snuggled right below Ginger, leaning on my legs. Yes, it was cold last night, but it sure warmed my heart and soul. Happy Wednesday! We are into the last round, we hope, of our battle against the rats. For those of you new on the scene, if you have chickens chances are you will soon have rats or some sort of predator or food nibbler. We have been fighting the rats for the 3 years we have had the chickens. We have lined the entire coop with hardware cloth, including the flooring, but they have tunneled underneath and found the "seams" of the wire. We have hung the food on wire cables and raise the feeders at night only to see the rats walking a mighty fine tightrope and then dropping into the feeders from the top. Then Farmer Jeff came up with these cool silos topped with old Ford hubcaps that the feeders were raised into. That didn't work either. The latest solution is sheer genius. Farmer Jeff poured 200 - 400 lbs. concrete pads, suspended the feeders from cable and then metal trashcans from yet another cable. At night the cans are lowered over the feeders and rest on the cement pads. Unless the rats are on steroids (which, well, you never know what they are up to!) they can't get under the cans. Farmer Jeff is quite proud of himself and I, in turn, am happy that the chickens are safe. Day 19 - Chicks are on their way! Day 15 on the Countdown to Baby Chicks! The Countdown to Baby Chicks Begins...NOW! More Peepers, Coming Right Up!